In my teenage years I spent all my pocket money at The Body Shop. I adored their products, I loved the ethos, I signed the petitions, I returned my bottles for refills and I owe my awareness to animal rights to Anita Roddick. These days The Body Shop products and retail units are nothing like the good old days and it makes me sad. I guess Lush filled the gap, they left behind when L'Oreal took ownership (FYI Lush is not as natural as everyone assumes!). I noticed the new Camomile range is doing the rounds in Blogland but I confess the ingredient list brings me out in a cold sweat. If you regularly follow my blog you will know I love Camomile (Chamomile). It can be a wonderful ingredient on sensitive skin but you will not feel the benefit if the other 99 ingredients are cheap irritating fillers. If I buy a product called Camomile Silky Cleansing oil I expect that ingredient to be first or second on the list, not last. I have highlighted in the list below the Camomile. CAMOMILE SILKY CLEANSING OIL Ingredients - Glycine Soja Oil/Glycine Soja (Soybean) Oil (Emollient/Skin Conditioner), Prunus Amygdalus Dulcis Oil/Prunus Amygdalus Dulcis (Sweet Almond) Oil (Skin-Conditioning Agent), Helianthus Annuus Seed Oil/Helianthus Annuus (Sunflower) Seed Oil (Emollient), C12-15 Alkyl Benzoate (Emollient), Caprylic/Capric Triglyceride (Emollient), Ethylhexyl Palmitate (Skin Conditioning Agent), Isohexadecane (Emollient/Solvent), Polysorbate 85 (Surfactant-Emulsifying), Sorbitan Trioleate (Surfactant-Emulsifying), Sesamum Indicum Seed Oil/Sesamum Indicum (Sesame) Seed Oil (Skin-Conditioning Agent), Octyldodecanol (Emollient), Parfum/Fragrance (Fragrance), Linalool (Fragrance Ingredient), Tocopherol (Antioxidant), Limonene (Fragrance Ingredient), Anthemis Nobilis Flower Oil (Fragrance/Essential Oil), Citric Acid (pH Adjuster). CAMOMILE WATERPROOF EYE & LIP MAKE UP REMOVER Ingredients - Aqua/Water (Solvent/Diluent), Isododecane (Solvent), Isopropyl Palmitate (Emollient), Potassium Phosphate (pH Adjuster), Hexylene Glycol (Humectant), Sodium Chloride (Viscosity Modifier), Dipotassium Phosphate (pH Adjuster), Trisodium Ethylenediamine Disuccinate (Chelating Agent), Decyl Glucoside (Surfactant), Polyaminopropyl Biguanide (Preservative), Disodium EDTA (Chelating Agent), Arginine (Skin Conditioning Agent), Taurine (Fragrance Ingredient), Anthemis Nobilis Flower Extract (Natural Additive). The ingredients above were taken from The Body Shop's website so they certainly do not hide what is in their products and they do offer the English translation which you see in brackets. However, I do find that this information is "hidden" in small print on their packaging! If you buy these Camomile products I think you are wasting your money. The cleansing oils I use and recommend, Blue Labelle, Handmade Naturals, Balm Balm, have three or four ingredients, which are ALL natural. There is no need for emulsifiers or emollients. So do me a favour and invest in truly natural skincare where someone has thought out the ingredients. Not only will it remove makeup but your skin will benefit from healing and soothing properties of plant extracts. Great post! 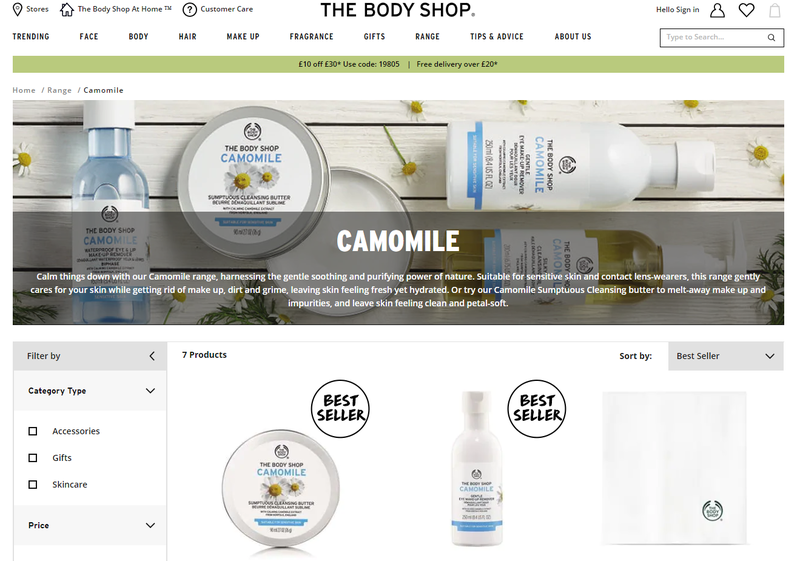 I'm a big fan of The Body Shop's products mostly because they don't irritate my skin, but to advertise something as being Camomile based and then to barely include it? Ridiculous! You sing it sister! Whenever I start telling someone about my beauty products they're like "oh you mean like the body shop right?". I admit I used to think it too when I was younger! Argh! yes so many people do that, if it's not TBS then they say Lush. I don't recall how "natural" TBS were are I wasn't aware of ingredients when I was younger but I do remember the banana conditioner has real banana in it as she was famous for that product. its such a shame isn't it. like you if i read Camomile i expect it to be the first or second product, not the last! I'm not so familiar with The Body Shop, but have erlier made som purshases from Yves Rocher, and they are no good either! One other thing is that I find it quite easy to find products free from SLS/SLES and parabens, but they contain phenoxyethanol insted. I try to avoid that as well, but it not so easy. It can be very hard to avoid phenoxyethanol it is common in many natural brands. I like to include brands like TBS as part of my "non-natural" beauty list. I definitely don't consider them "natural", despite what they claim on their packaging. They have too many fillers in there! Excellent post Sarah. I am old enough to remember Bodyshop when they started up and while they have never been quite as green as they portrayed themselves, I feel they have really sold out, now a prime example of greenwashing.